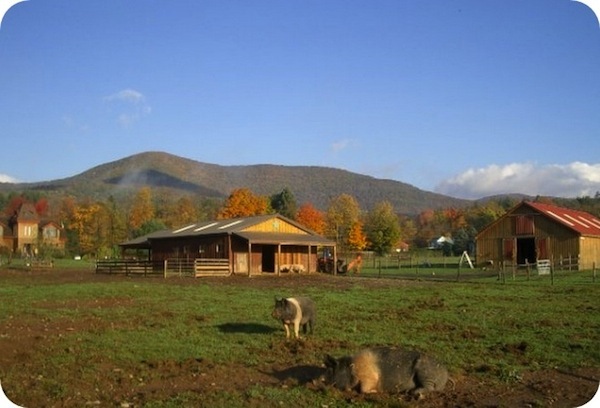 Nestled in beautiful Saugerties, N.Y., the Catskill Animal Sanctuary (CAS) opened its doors in 2001. The sanctuary sits on 110 peaceful acres, which provide a safe and loving home for the many farm animals CAS rescues from cruel, abusive and neglectful treatment. Since 2001, CAS has rescued over 2,000 such animals. 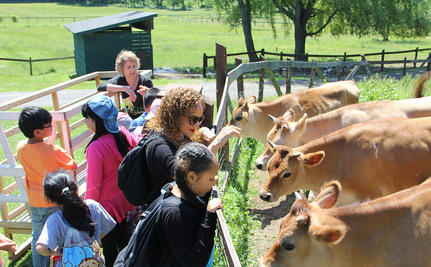 In addition to its wonderful rescue work, CAS offers weekend and special tours, a summer day camp for children, vegan cooking classes, speaking engagements by its founder, Kathy Stevens, and educational programs about farm animals and industrialized animal cruelty. CAS guests may arrange to stay on site in a lovely 1800s-era farmhouse known as The Homestead. CAS’s big autumn event is its Annual Shindig, to be held on Oct 5th. This year’s Shindig — a “Festival of Vegan Living” — promises to be the biggest one yet. More than 600 guests attended in 2012, coming from as far away as Philadelphia and Boston. This year, CAS anticipates up to 800 guests. Attractions include tours to meet the animals and hear their rescue stories, a silent auction, a children’s tent and hayrides. As a “Festival of Vegan Living,” the Shindig will provide information on the vegan lifestyle for those considering the switch or looking for more information. Guests can taste a wide variety of vegan food and explore several vegan vendors’ wares while enjoying live music from two bands. Four vegan cooking demonstrations are scheduled during the day. Victoria Moran, author of Main Street Vegan, will be a special guest speaker. “Our goal is not only to raise funds for the continued rescue, rehabilitation and care of as many farm animals as possible, but to educate on the values of the vegan lifestyle and create a fun day for the whole family,” CAS’s Adrienne Borgersen told Care2. 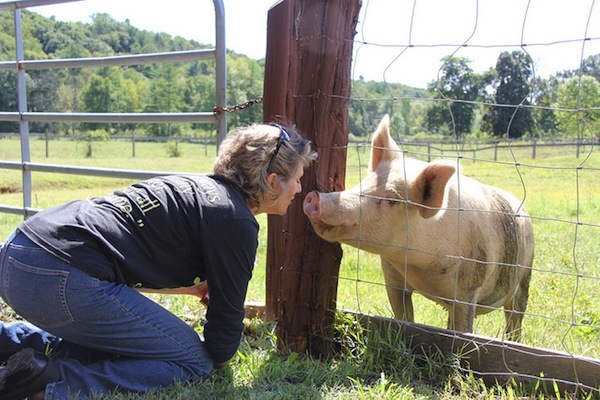 Farm Sanctuary has become perhaps the most iconic animal sanctuary in the U.S. Established in 1986, Farm Sanctuary’s very first rescue was Hilda, a sheep which collapsed under harrowing transport conditions after arrival at a stockyard. She was thrown, still alive, onto a pile of maggot-ridden dead animals for disposal. Lucky for Hilda, someone spotted her, put her into Farm Sanctuary’s VW van and changed her life forever. Since then, Farm Sanctuary has grown to three locations — Watkins Glen, an idyllic and beautiful 175-acre farm in upstate New York; Orland, Calif., a gorgeous 300-acre farm in northern California; and a lovely 26-acre shelter at a hacienda ranch in Acton, Calif., near Los Angeles. Thousands of cows, pigs, chickens, turkeys and sheep owe their lives to this terrific organization. Farm Sanctuary’s autumn event is its annual Celebration for the Turkeys, held in Watkins Glen, Orland and Acton. Each Thanksgiving season, the sanctuary treats its rescued turkeys to their own special feast of greens, stuffed squash, cranberries and pumpkin pie. The “Feeding of the Turkeys” ceremony is an annual highlight for guests, who later get to enjoy their own impressive all-vegan holiday feast. Guest speakers in the recent past have included Loretta Swit, Gene Baur, Bruce Friedrich, Victoria Moran, Susie Coston and many others. It’s a heart warming and compassionate celebration for vegans and the vegan-curious. The Orland event is scheduled for Nov. 2nd, the Acton event for Nov.9th and the Watkins Glen for Nov. 16th. Tickets go on sale soon. About an hour north of West Palm Beach, Fla., is the largest sanctuary in the world for rescued chimpanzees. It’s known as Save the Chimps, and nearly 300 chimpanzees rescued from research laboratories, the entertainment industry and the pet trade have found a new home there. Established in 1997, Save the Chimps is the organization that stepped up to respond to the need for a sanctuary for chimpanzees no longer wanted by the U.S. Air Force for research purposes. Save the Chimps litigated and won the right to rescue 21 former Air Force research chimps from the notorious Coulston Foundation in Alamogordo, N.M. In 2002, a bankrupt Coulston Foundation turned over 266 additional research chimps and its entire laboratory facilities to Save the Chimps. 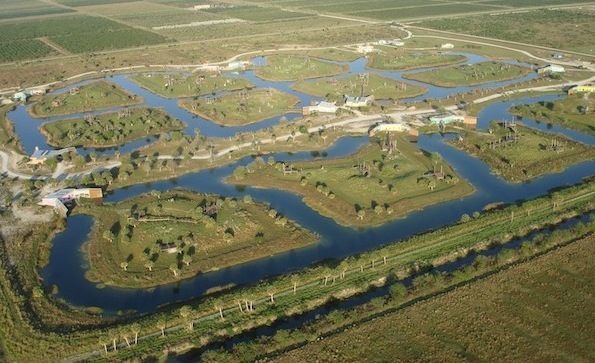 Between 2004 and 2011, all the laboratory chimps moved across the country to their new permanent home in Fort Pierce, Fla. They now live in a world-class sanctuary on 150 beautiful acres. It is divided by artificial waterways into 12 three-acre islands, where the chimps can freely roam as they please, play on climbing structures and live and eat within a secure, hurricane-proof housing area. Below is an aerial shot of the sanctuary grounds. Save the Chimps doesn’t typically open its doors for visits or tours, except by special invitation. On Sept 21st, however, it will offer an extraordinary opportunity — its first-ever Member Day. Members will be able to take hour-long guided tours of the 150-acre sanctuary grounds. Six walking tours and three bus tours will be available that day. There will be no physical contact with the chimps, but there’s no telling how many of them visitors will be able to see along the way. Reservations are required, and you must be a 2013 member (approximately $50) to participate. Special rates are available for children. Who doesn’t want to see a whole bunch of chimpanzees, finally free to live it up and enjoy themselves? Woodstock Farm Animal Sanctuary (WFAS) began in 2004 as nothing more than an empty, unfenced hay field. That, and a deep desire to help farm animals, was all that founders Jenny Brown and Doug Abel needed to begin realizing their dream. Starting with a small group of rescued chickens and a rooster, WFAS has since grown into a sanctuary with two barns, five chicken coops, two cattle sheds, a poultry shed, an animal medical treatment room and a visitor center. WFAS has rescued hundreds of farm animals taken from cruel and abusive situations during investigations of stockyards, auctions, farms and slaughterhouses. Some are adopted out to loving new homes, while others live out their lives at WFAS. WFAS says its annual ThanksLiving Banquet event sells out every year, and it’s not difficult to understand why. Talented chefs serve up a cruelty-free Thanksgiving banquet for 250 people. The event combines elegance with a farm atmosphere — the meal is served inside a heated tent in the sanctuary’s goat pasture. The turkeys, of course, get to eat first. After they’ve stuffed themselves (in a good way), the human guests have their turn. In addition to the banquet itself, participants can enjoy a silent auction, a raffle and a great lineup of vegan-friendly vendors of all types. This will be WFAS’s eighth ThanksLiving Banquet. It’s the most critical fundraiser of the year. The money needed to run the sanctuary through the winter months comes from what is raised during these festivities. According to the web site, ThanksLiving 8 is already sold out and has a long waiting list for cancellations. Keep this one in mind for next year, though, and check early for tickets so you won’t miss out. Reading this just made me sooo happy ... bless all those wonderful creatures and the magnificent people who take such good care of them.